With the coming full moon the tides have been higher than normal making my trek to the dock a bit soggy at times. The water has been over the bank all week at high tide. Old Man River, the Great Blue Heron is sitting on the bow of the Jon boat before he spots me and flies over to his other favorite pier to watch the sunrise. I capture some distant shots of the Bald Eagle and a female Northern Harrier flying over the marsh this week also. The white feather patch at the base of the tail identifies the Harrier. After an hour of seeing very few birds this morning I decide to head for the house. 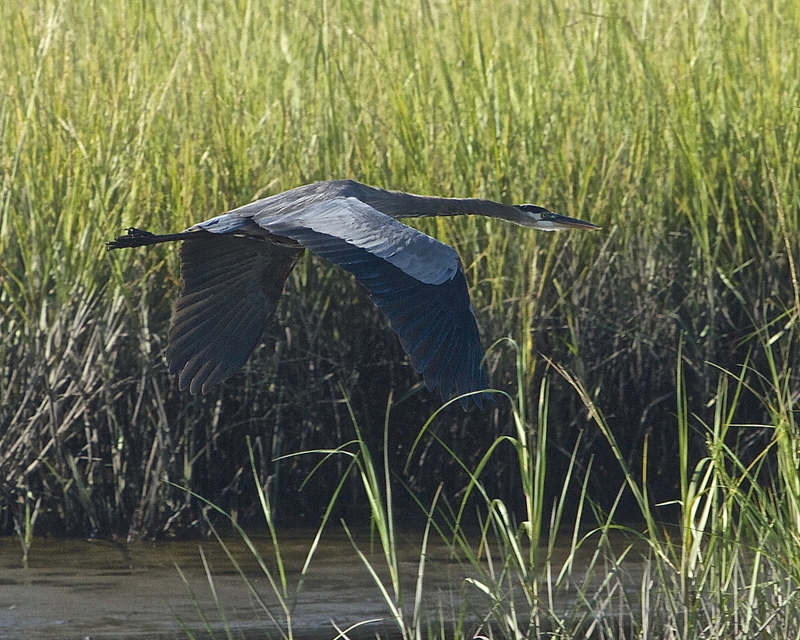 As I get to the back porch I turn to scan the marsh and then I spot it. 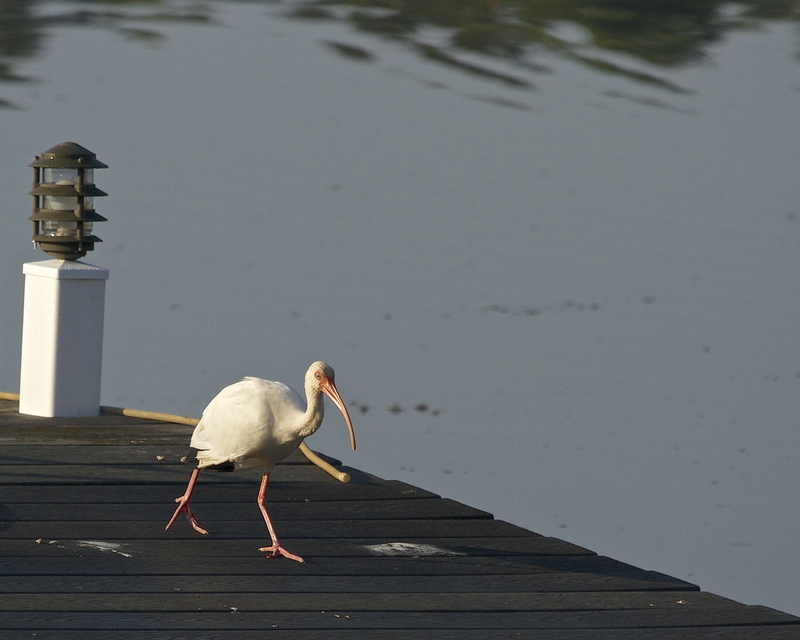 Walking down the pier towards the neighbor’s fence is a “White” Ibis. 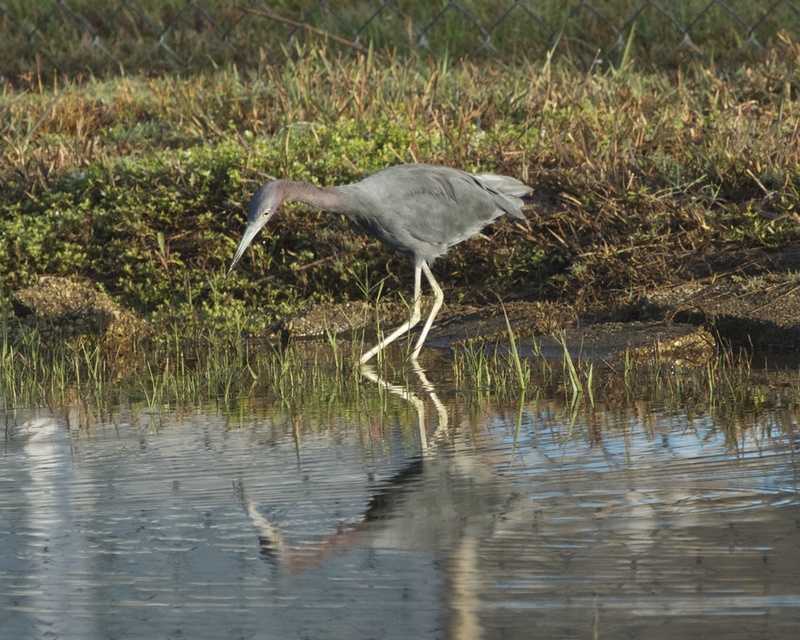 These wading birds are fairly common in Florida but not often seen on this part of the Broward. I have seen them fly over in small groups but hardly ever see them land this close to my dock. With a quick about face I head for the fence hoping not to spook it. I crouch low (but not low enough for Jack ;) ) and approach slowly. It takes a quick glance at me and continues poking that long pink beak through the grass looking for insects and crabs. A marsh crab snack is soon in its beak. With a quick flip and swallow, the morsel is soon breakfast. With a quick push of the doohickey it becomes my shot of the day. Following it along the fence I capture a few more moments with this beautiful bird until it hops over the fence looking for yard insects. Juvenile White Ibis have mottled brown feathers, as do some of the older adults. The pink beak turns scarlet red around the eyes in mating season. The long curved beak is the prominent feature that identifies this bird species. A “pink” variant is also sometimes seen which looks very similar to the White only with pinkish wings. It is a hybrid cross of a White with the South American Scarlet Ibis. On a recent trip to the Viera Wetlands I did capture a photo of a Glossy Ibis. 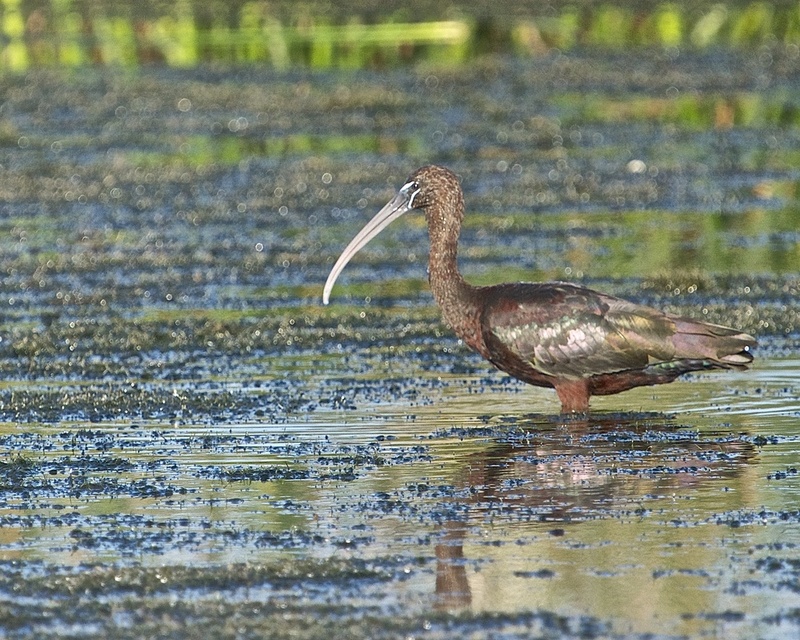 This Ibis species has a dark glossy plumage and white striping near the dark eyes. 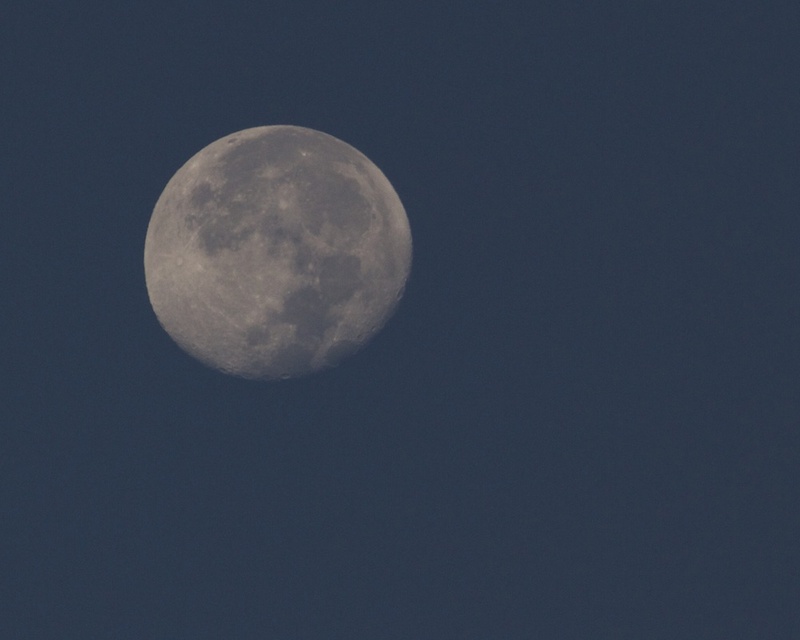 A nearly full moon rises long before sunset and sets after sunrise. Tides have been higher than normal. Old Man River the Great Blue Heron takes flight. 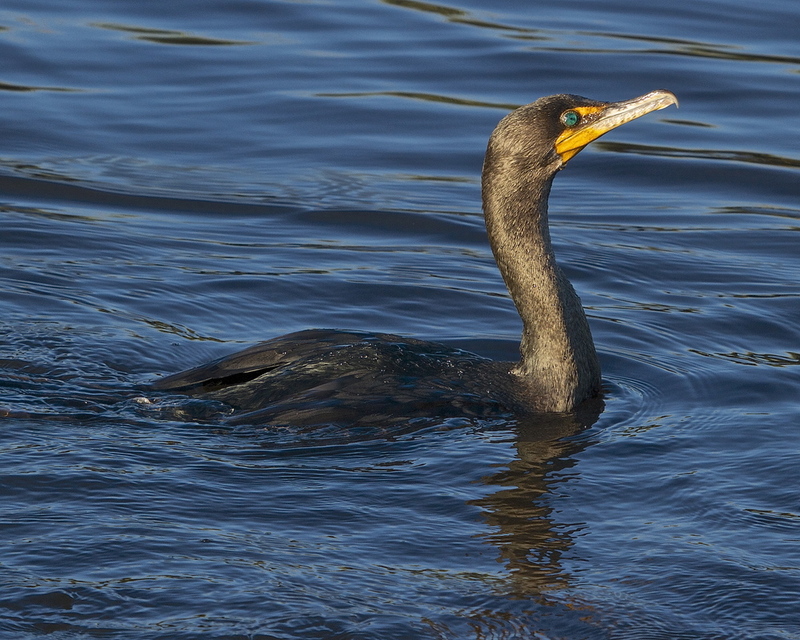 A Cormorant pauses after a swim. Note the almost fur like feathering. A Northern Harrier flies over the marsh looking for prey. Old Man River reflects in the golden morning light at one of his favorite posts. As I lock back I see a White Ibis walk up the pier. The Ibis looks at me and decides I am no threat. Oh boy, a nice marsh crab sandwich! White Ibis in breeding colors Ft Desoto May 2013. Note the Scarlet red around the face. Small flock of ibis feeding in lawn Florida Keys, photo by Donna Yost Williams. Got your iphone, ipad, and now your ibutts...the end! ..photo by Donna Yost Williams. It is an October dawn on the Broward. Change is in the air. Temperatures have dipped below 60 finally. Bird air traffic has resumed. The sky is crisp and blue, there is early morning cold wet dew from the condensation on the grass and other surfaces. The smoke from the powerplant chimney rises upward, little wind effects at all. Small wisps of thin smoke like fog swirl over the top few inches of the river. The Yellow Crowned Night Herons (George & company) have not been seen since the shutdown began. They probably moved south as other migratory fowl begin their southern sojourns (or it could still be a funding issue). I will miss George’s antics and crab feasts. But new faces are starting to be seen. And some old familiar ones too! 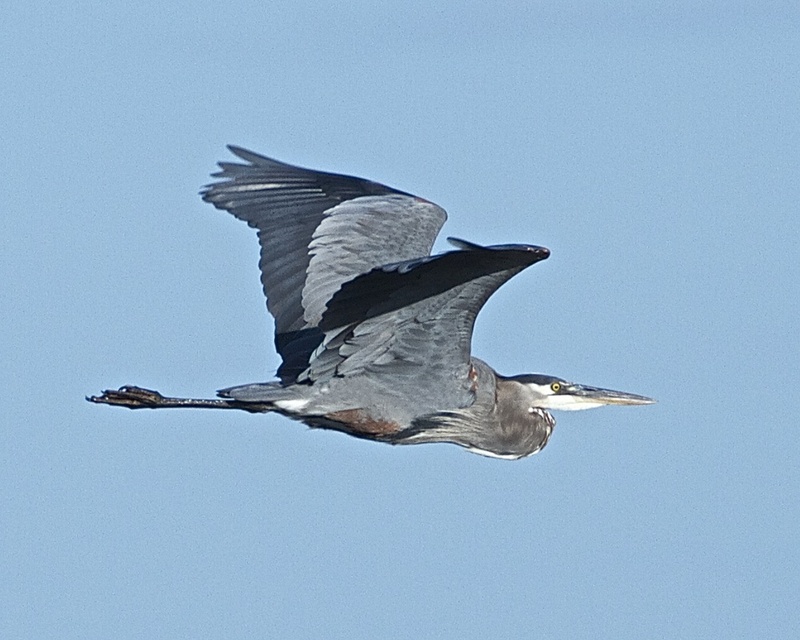 Old Man River, the venerable Great Blue Heron and Patriarch of the Broward has returned to some familiar patterns. Early in the mornings I see him on the dock next door and on the old pier a few houses down on a more routine basis now. Like before, he expresses his angst at my appearance and slowly raises his huge broad wings to take flight just a bit up river. Out of sight, out of mind it seems his routine. Time to get the old duck blind out and surprise the Old Man at his own game. Or perhaps I can sneak up on him in the Kayak for a photo op. A V-shaped wedge of about 24 Cormorants fly over the river. Though still scarce, the Bald Eagles have returned to the area to fish along the river. When I get back in the Kayak later this month I hope to get some better photos of them. Yellow-rumped Warblers and Red Winged Blackbirds flit in the marsh grass. A few Roseate Spoonbills and Wood Storks rest on the dock at low tide. They are soon joined by Old Man River, a Tri Colored and a Little Blue Heron. A White Pelican later drifts by in the main channel. I expect to see the Brown Pelicans arrive soon also. The Belted Kingfisher males are constantly challenging each other for territory. George the Yellow Crowned Night Heron and most of the Black Crowned Night Herons have left the Broward. Hope to see them back next year. The Night Herons will be back in the spring! Old Man River, the Great Blue Heron is very camera shy still. As soon as I arrive he raises those wings and leaves. A V-shaped wedge of cormorants fly over the Broward. Old Man River prefers to keep a low profile in the marsh. The Wood Storks and Roseate Spoonbills gather on the dock at low tide. The Wood Stork uses its wing to help see and scare fish into its waiting beak. The Belted Kingfisher claims is territory and challenges the other males. This is about as close as we get to Autumn colors on the Broward. The Marsh grass is beginning to turn brown too. A female Red Winged Blackbird feeds on the marsh grass. Fall has arrived on the Broward. Roseate Spoonbill fly by. Soon they will leave the area also. Juvenile Little Blue Heron (born all white). White Pelican fishing in the channel. A solitary Old Man River silhouetted in the sunset reflects on bygone days. The Broward River government shutdown continues. As I sit on the dock on this cool October morning no birds are flying. 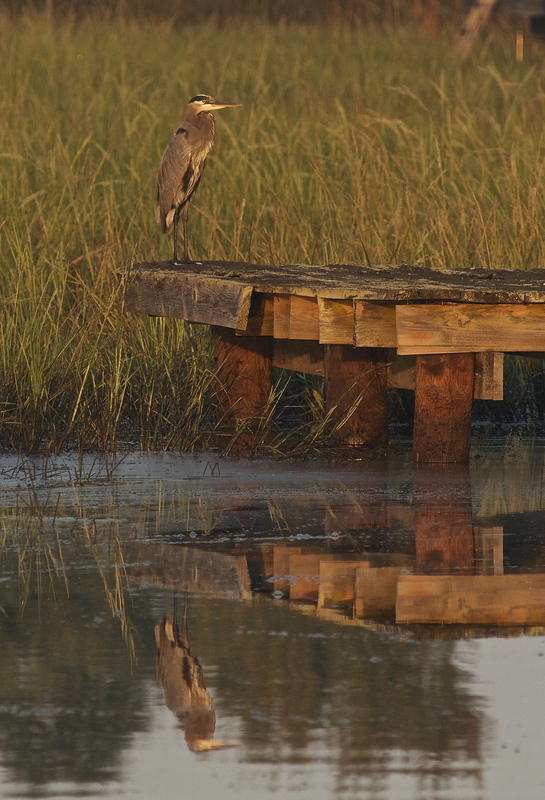 A Tricolored Heron and a Little Blue Heron walk up the dock and stare into the water below. As I scan the marsh in front of me I see the grass begin to move near the waters edge of a small little area directly in front of me. I fully expect to see some sort of creature emerge from the marsh. As I continue to watch, some stalks of grass disappear below the surface. A large grey nose breaks the surface. It is a manatee feeding on the crisp green marsh grass. Although it never fully surfaces I see the tell tale swirls caused by its large paddle shaped tail fin. It glides right beneath my feet in silent serene peace at it heads back up the channel towards the river. Behind me a soggy raccoon emerges from the marsh and heads up towards the neighbor’s bird feeding area to look for seeds on the ground. I decide to drive over to Goose Pond (a nearby retention pond) to see what is going on there. Evidently the International flights are not grounded as I see a flight of Canada Geese honking their arrival and glide into a perfect formation landing. There must have been close to 50 Canada Geese and probably slightly greater numbers of Mallard Ducks on the pond. A good number of these geese never left the pond this year. There is free corn provide daily, relatively safe shelter with no “gators” in the pond (yet), and fresh fish snacks in the water if they get tired of free corn. You can’t beat the weather either compared to northern parts of the US and Canada in the winter. Plenty of food, warm weather, shelter…hmmm sounds like “snowbird syndrome”. As I watch some of these geese “land” (more like plop) I can hardly believe they ever get off the ground let alone fly. These are some very plump geese! Also I note that there are few other local varieties of marsh birds in the pond. I do see one Anhinga and a Little Blue Heron in the area. The Mallard is the most common duck found in Florida but I expect to see some of the other migratory ducks arrive in the near future. Can’t wait to see a Hooded Merganser on the river. Maybe someone could call the Robertson clan in Louisiana and see if they want to do a Duck Dynasty episode here. Tricolored Heron watches for signs of fish below. It took a water taxi to get here this morning I think. Little Blue Heron on the hunt. A soggy racoon heads for the bird feeders. 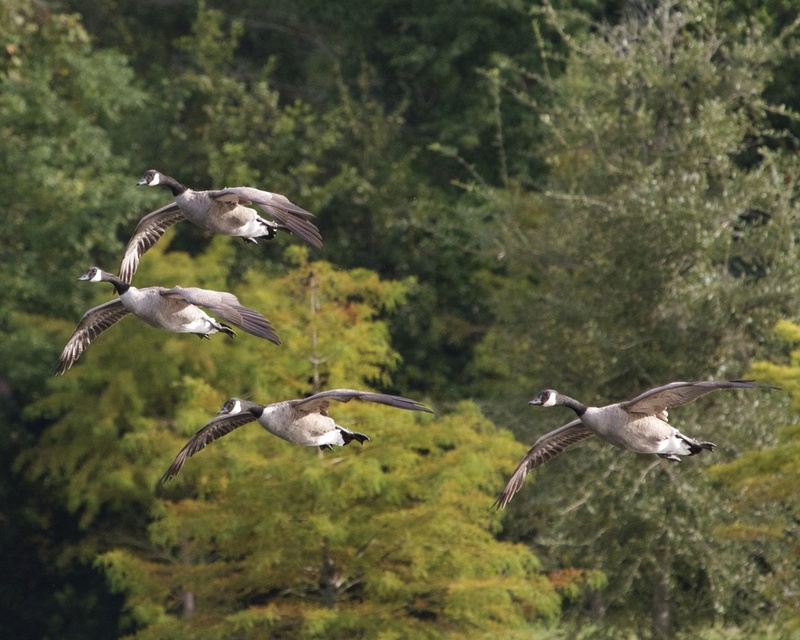 A flight of Canada Geese honk their arrival. International flights are arriving ok. 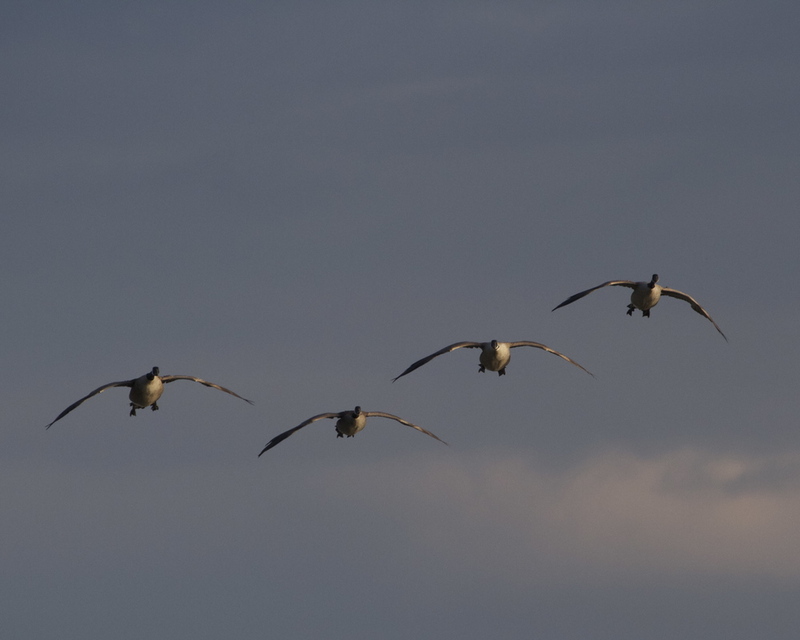 They bank to make their landing approach in unison. Time series sequence shot of the approach. Time series of the lead goose landing. Four photo sequence used. Fat Albert landing, tail feathers dragging low. Now where is that free corn? Did someone say free corn? Gimmee some too! October has brought beautiful weather to the Broward this past week. Temperatures are cooler, the skies seem bluer and the sunsets are getting prettier by the day. Unfortunately due to the recent government shutdown, no birds are allowed to fly over the river and all Kayak trips have been cancelled. All feathered fowl flights have been grounded due to lack of proper air traffic control support. I do have some good news to report though. Prior to the shutdown the local Red Shouldered Hawk nailed a copperhead in my back yard and Old Man River, the Great Blue Heron, was seen dining on a large water moccasin. A Black Crowned Night Heron also feasted on an unknown snake species found in the channel at low tide. Birds “3”, Snakes “Zero”. In the meantime substitute “birds” (aka insects) are flying around instead. As I sit and watch the marsh totally void of birds a dragonfly approaches me coming up the floating dock gangway. It goes into a hover for a good minute or two it seems. I adjust the focus for close up photos and start pushing the doohickey. My shutter speed was only able to freeze motion on parts of the wings. Still, the detail that can be seen is incredible. Although not a true “macro”, the lens captures details of design, function, color and the wonder of creation. 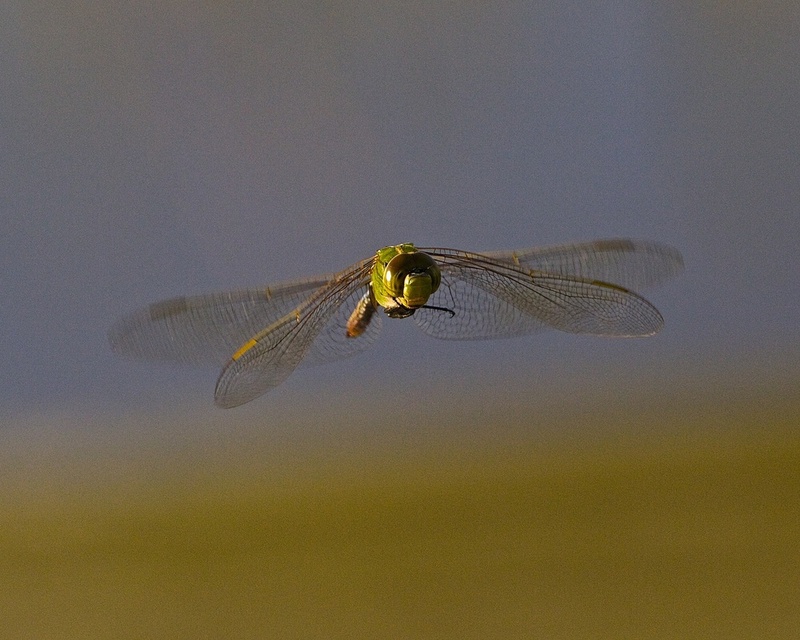 Dragonflies are ancient and have not changed much since they were created. One fossil found had a wingspan of about three feet. Dragonflies are not related to common houseflies but are closer to damselflies. They live most of their life in water (up to three years) in a larva-like stage and have only a brief adult stage when they emerge from the water. They grow wings, fly for about three weeks and mate and die soon afterwards. So when you see a winged dragon fly it is near the end of its lifespan. There are two pairs of transparent wings with structural shapes that can be seen in the photos. There are more than 5,000 individual species. They are not harmful to humans, i.e. don’t bite etc., but feast mainly on mosquito larva, and small fish. Their large compound faceted eyes contain thousands of tiny lenses that give them a nearly 360-degree view. They can hover, fly sideways, backwards and forward at 30 miles per hour. In actuality it is myself that has only been temporarily grounded and not the birds. In a few weeks I hope to back on the Broward with my camera. In the interim I will pause, refresh, and reflect on the coming autumn as I recover and share whatever flies by. And if, like the dragonflies, you see me sprout some “wings” someday, fear not. It is not the end, just the beginning. Be Blessed. Harry. Sunrise Surprise. Now hear this. Due to the Government shutdown, all flying bird traffic on the Broward is on hold due to lack of air controllers and safety concerns! Only swimmers and waders authorized. Black Crowned Night Heron gets a snake! Can't fly, might as well get some sun! Annie the Anhinga dries out on the dock. 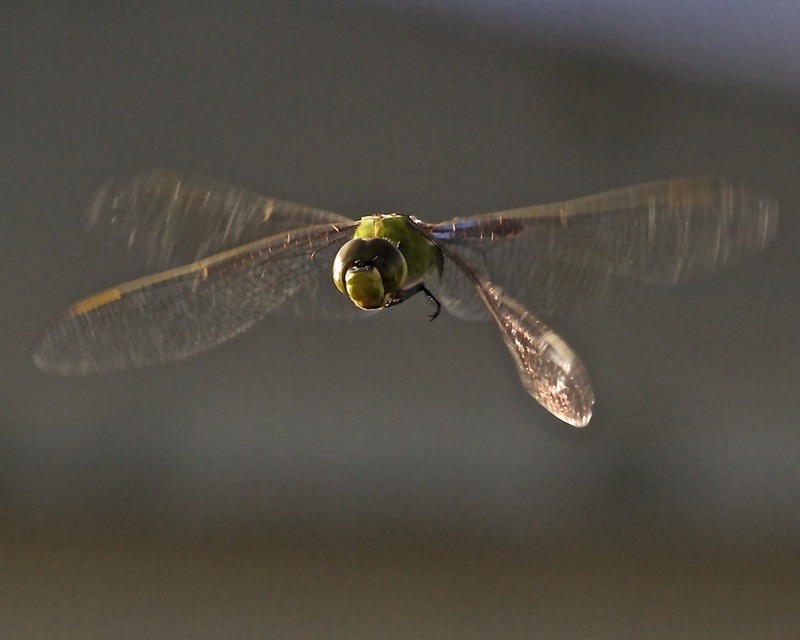 Bug eyed view of a Dragon Fly hovering over the dock. 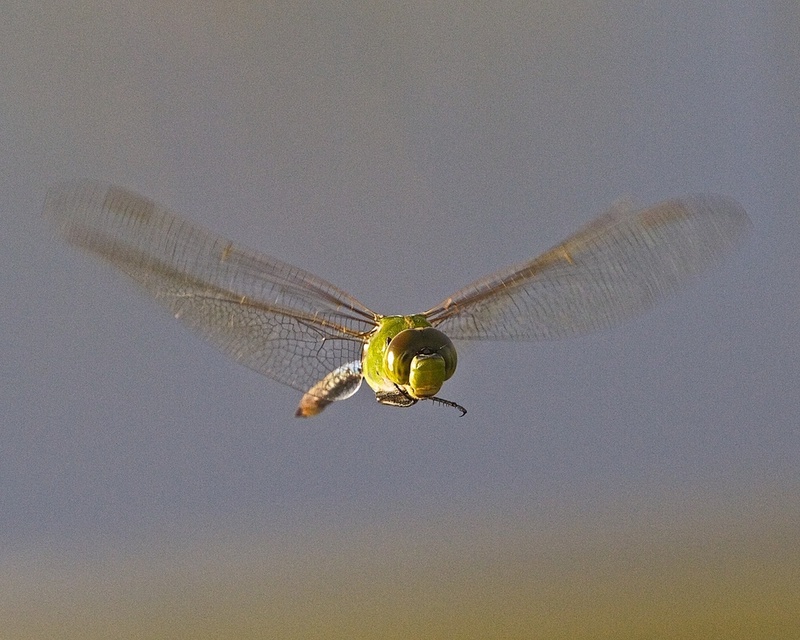 Four wings allow the Dragon Fly to hover, move sideways, backward and forward at speeds up to 30 miles per hour. With only about three weeks left to live, a winged Dragonfly must find a mate, procreate, and then the circle of life begins again for another generation. The structure of the wings show intricate detail and design. Intelligent Design or primordial ooz accident?